Start with the salsa. Preheat the oven to 180˚C/gas mark 4. Place the tomatoes on a baking tray and drizzle with the oil. Place in the oven to roast for 30 minutes or until slightly wilted and tender. Remove and set aside to cool a little. Place the roasted tomatoes into a food processor with the remaining ingredients and pulse to your preferred texture. For the fritters, sift the ground rice, flour, baking powder, salt, coriander and cumin into a bowl. Add the egg, lime juice and 125ml water and beat to a smooth batter. Add the corn, salad onion and coriander and stir to combine. Heat the oil in a large, non-stick frying pan over a medium to high heat. When the oil is hot, add 3 tbsp of mixture for each fritter and flatten with the back of a spoon. There should be enough for 2–3 fritters per person. Cook for about 4–5 minutes, or until golden brown, then turn and cook the other side. 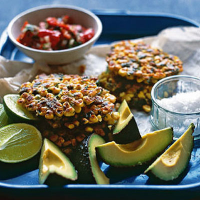 Serve with the salsa and some avocado wedges. The salsa will perk up the fritters, but a bucks fizz will give them a real kick. Prosecco La Marca NV Italy. Bin 83919; £6.99. Freshly Squeezed Orange Juice (£1.69/500ml).